Source: Sparkfun.com This work is licensed under a Creative Commons Attribution-NonCommercial-ShareAlike 3.0 Unported License. Soldering is one of the most fundamental skills needed to dabble in the world of electronics. The two go together like peas and carrots. 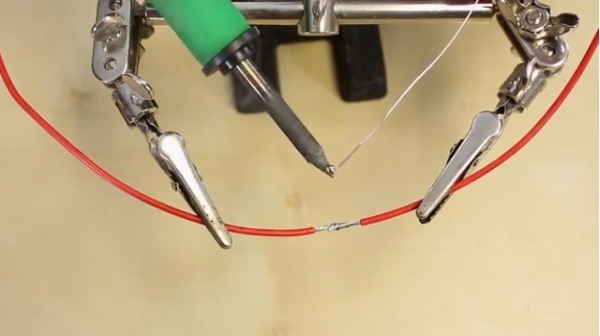 And, although it is possible to learn about and build electronics without needing to pick up a soldering iron, you’ll soon discover that a whole new world is opened with this one simple skill. We here at SparkFun believe that soldering should be a skill in everyone’s arsenal. In a world of increasing technological surroundings, we believe it is important that people everywhere be able to not only understand the technologies they use everyday but also be able to build, alter, and fix them as well. Soldering is one of many skills that will empower you to do just that. In this tutorial we will go over the basics of through-hole soldering – also known as plated through-hole soldering (PTH), discuss the tools needed, go over techniques for proper soldering, and show you where you can go from there. 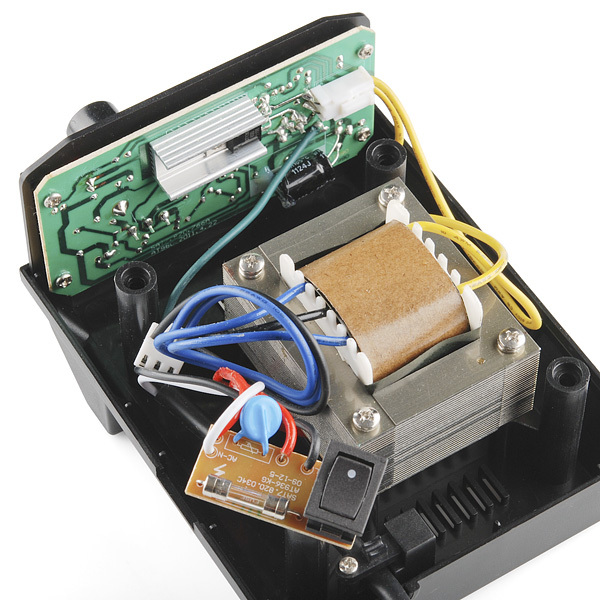 We will also discuss rework as it pertains to through-hole soldering and give you some tips and tricks that will make fixing any piece of electronics a breeze. This guide will be for beginners and experts alike. Whether you’ve never touched an iron before or are looking for a little refresher, this tutorial has a little something for everyone. If you’re all caught up on the above reading, let’s dive right in! 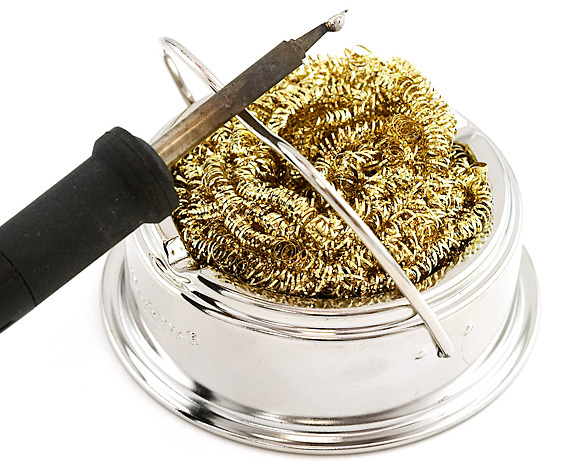 Before learning how to solder, it’s always wise to learn a little bit about solder, its history, and the terminology that will be used while discussing it. 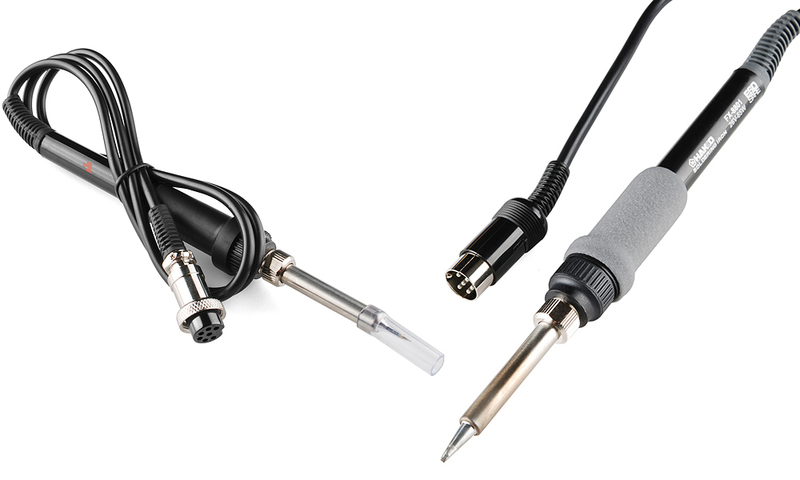 Solder, as a word, can be used in two different ways. Solder, the noun, refers to the alloy (a substance composed of two or more metals) that typically comes as a long, thin wire in spools or tubes. 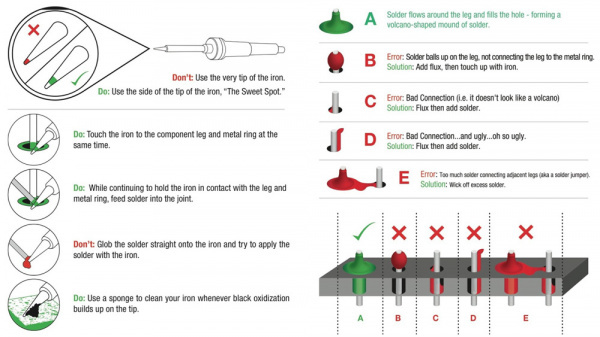 Solder, the verb, means to join together two pieces of metal in what is called a solder joint. So, we solder with solder! Solder wire sold as a spool (left) and in a tube (right). These come in both leaded and lead-free varieties. One of the most important things to be aware of when it comes to solder is that, traditionally, solder was composed of mostly lead (Pb), tin (Sn), and a few other trace metals. This solder is known as leaded solder. As it has come to be known, lead is harmful to humans and can lead to lead poisoning when exposed to large amounts. Unfortunately, lead is also a very useful metal, and it was chosen as the go-to metal for soldering because of its low melting point and ability to create great solder joints. With the adverse effects of leaded soldering known, some key individuals and countries decided it was best to not use leaded solder anymore. In 2006, the European Union adopted the Restriction of Hazardous Substances Directive (RoHS). This directive, stated simply, restricts the use of leaded solder (amongst other materials) in electronics and electrical equipment. With that, the use of lead-free solder became the norm in electronics manufacturing. 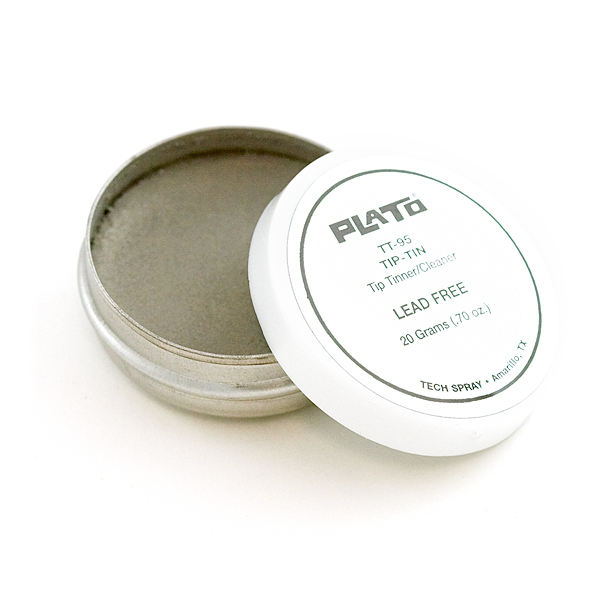 Lead-free solder is very similar to its leaded counterpart, except, as the name states, it contains no lead. Instead is is made up of mostly tin and other trace metals, such as silver and copper. This solder is usually marked with the RoHS symbol to let potential buyers know it conforms to the standard. When it comes to manufacturing electronics, it’s best to use lead-free solder to ensure the safety of your products. However, when it comes to you and your electronics, the choice of solder is yours to make. Many people still prefer the use of leaded solder on account of its superb ability to act as a joining agent. Still, others prefer safety over functionality and opt for the lead-free. 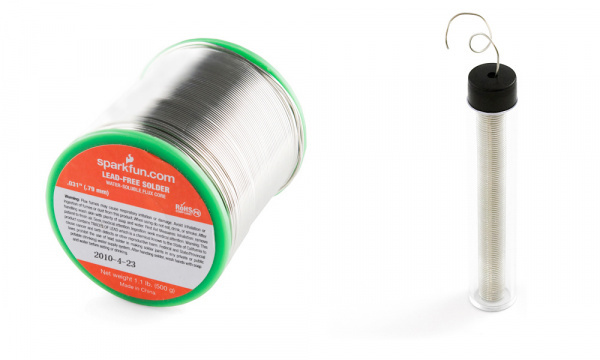 SparkFun sells both varieties to allow individuals to make that choice for themselves. Lead-free solder is not without its downfalls. As mentioned, lead was chosen because it performs the best in a situation such as soldering. When you take away the lead, you also take away some of the properties of solder that make it ideal for what it was intended – joining two pieces of metal. One such property is the melting point. Tin has a higher melting point than lead resulting in more heat needed to achieve flow. And, although tin gets the job done, it sometimes needs a little help. Many lead-free solder variants have what’s called a flux core. 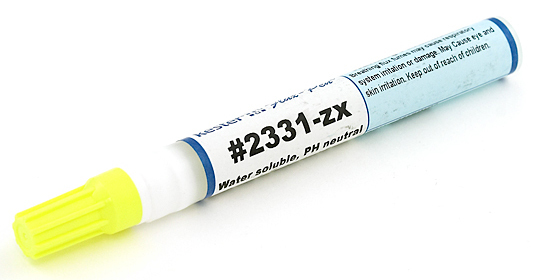 For now, just know that flux is a chemical agent that aids in the flowing of lead-free solder. While it is possible to use lead-free solder without flux, it makes it much easier to achieve the same effects as with leaded solder. Also, because of the added cost in making lead-free solder, it can sometimes be more expensive than leaded solder. Aside from choosing leaded or lead-free solder, there are a number of other factors to consider when picking out solder. First, there are tons of other solder compositions out there aside from lead and tin. Check out the Wikipedia solder page for an extensive list of the different types. Second, solder comes in a variety of gauges, or widths. When working with small components, it’s often better to use a very thin piece of solder – the larger then number, the smaller the gauge. For large components, thicker wire is recommended. Last, solder comes in other forms besides wire. When getting into surface-mount soldering, you’ll see that solder paste is the form of choice. However, since this is a through-hole soldering tutorial, solder paste will not be discussed in detail. Two varieties of wands. Notice how the tips screw into the wand allowing for interchangeability. 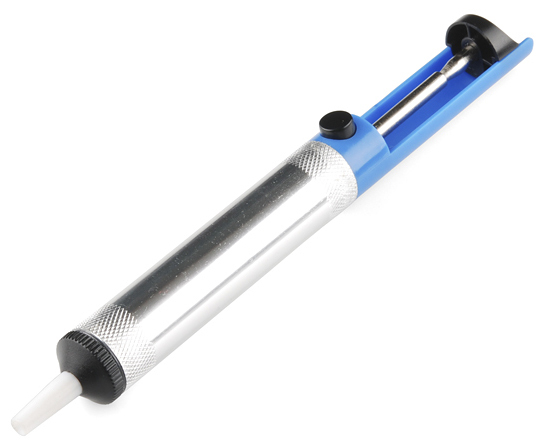 Some wands have tips that simply push in and pull out without any attaching mechanism. 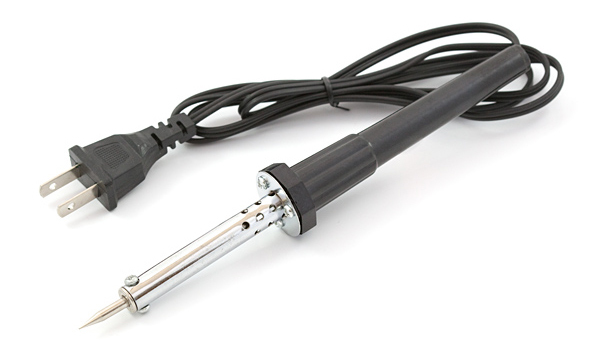 Some irons consist of just a wand that plugs into a wall outlet. These irons are as simple as they come, and they do not have any controls to vary the temperature. In these irons, the heating element is built directly into the wand. 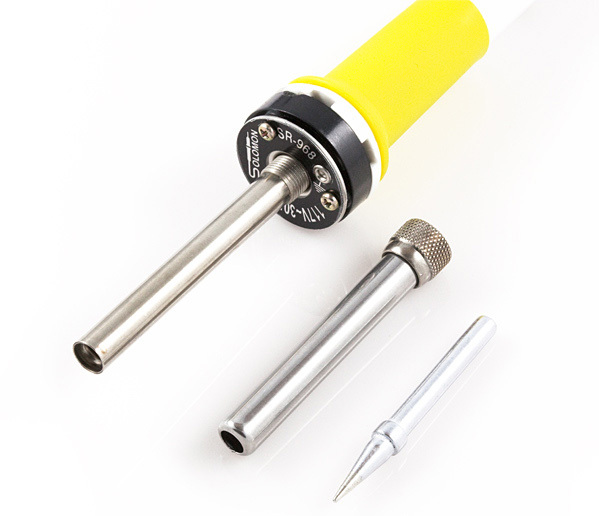 A simple soldering iron that consists of just the wand. Some of these irons do not offer interchangeable tips. We’ve also put together this digram to help you better understand what makes a good solder joint. Click for a larger image. When working with lead-free solder, flux tends to get everywhere, be it from the flux in the solder or from external flux applied by the user. Flux can corrode the PCB and components over time, thus it’s good to know how to clean your PCBs so they’re free of any flux residue. The simplest way to clean a board is to use a small brush (toothbrushes work great) and some isopropyl alcohol. If you are soldering more than a few boards, it may be necessary to clean them in batches. For this, we recommend a crock pot filled with distilled water. The distilled water keeps other impurities and contaminants away from your circuit. It’s not 100% necessary to clean your board, however, it will increase the life of your circuit tremendously. For more information on PCB cleaning, click here.